I just can’t believe how fast time flies… I just started blogging and now we have our 1st year behind us. I was thinking what to write about and while I was debating, I looked through my kitchen window and just knew my topic instantly. 2 weeks ago we had to make a necessary purchase in one of the home depots in the neighbourhood. On the way in they had a whole garden section displayed outside, with all these stands with flowers, bushes and herbs. I’ve always wanted to have my own garden with fresh veggies and herbs, but since I'm living in a small apartment, I had to keep dreaming. Well, for sure? When we passed this garden section I decided I’m not leaving before I have at least something to plant in the pots. We made our shopping and while leaving I told Cookies I’m not going before I get my needs fulfilled… I bought a big, long pot, put Cookies into the line to cash out, and run to pick my plants. Was looking for coriander and basil but ended with thyme, rosemary and the 3rd one I didn't know what was actually, I just hoped it’s eatable 0_o. Then in the line Cookies said… well I think you need some soil, woman 0_o. Uh Oh indeed and I made him run to find not so big bag ;-). Leaving the store I was happy like a pig in the mud… after we came back I started playing with my new purchases. Believe me, I never planted crap before so I was kind of lost but as it’s shows it worked.. though I made such mess that Cookies almost got a freaking heart attack… soil was everywhere… on the counter, floor, me 0_o. 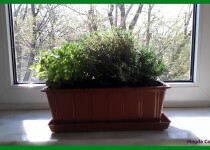 I think I used all the silverware but here it is, my little herb garden on the windowsill ;-). 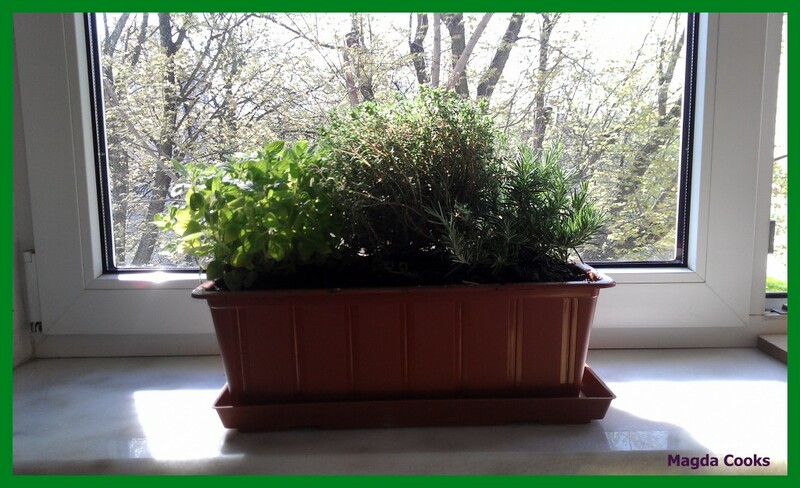 Now after couple weeks it’s growing like crazy, thyme almost went outside and the oregano (it was oregano actually) is climbing almost to the ceiling… I love it extremely much and try to utilize it as much as possible. The best recipe for this is my tossed potatoes. My first idea about this side dish I got from Hare Krishna cookbook I purchased a long time ago, until now I changed this recipe plenty of times and the end result is what Cookies likes the most. P.S. Cookies thoughts: I love these “pots” they are SUCH good stuff, and happy 1st anniversary to MAGDA COOKS... and as usual, (and NOT because she’s the wife either! ), Magda Cooks... it just right.